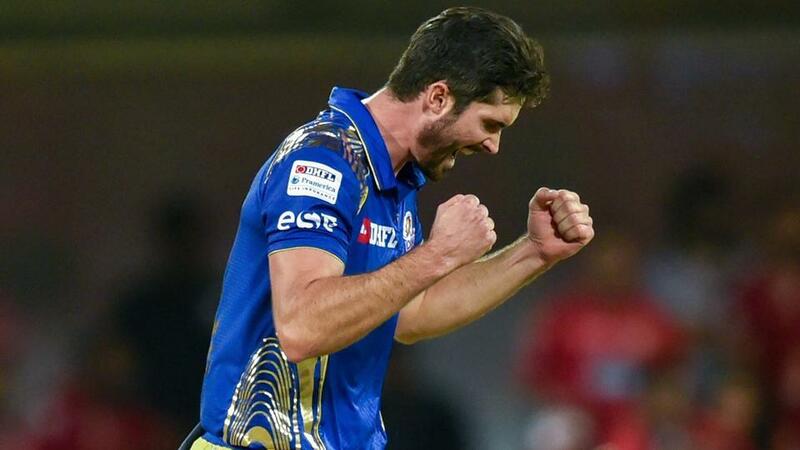 The defending champions, Mumbai Indians (MI) held their nerves in the dying moments to beat Kings XI Punjab (KXIP) by three runs at the Wankhede Stadium to keep their hopes alive in this edition of the Indian Premier League (IPL). Batting first, Mumbai got off to a flier, courtesy inform Suryakumar Yadav. However, a brilliant spell from Andrew Tye reduced Mumbai to 71 for four in the ninth over. Since then, Kieron Pollard (50) started to rebuild the inning partnering Krunal Pandya (32). The pair added 65 runs, as Mumbai posted a challenging total against a devastating batting order. In reply, however, Punjab lost their Windies superstar Chris Gayle (18) early at the score of 34 runs. Since then KL Rahul (94) and Aaron Finch added 111 runs for the second wicket to take their innings closer to the victory. Meanwhile, some brilliant bowling by Jasprit Bumrah (three for 15) brought back the host in the game. Moreover the Kiwi seamer, Mitchell McClenaghan defended 17 runs off the last to bring two crucial points. As a result, Mumbai jumps up to the fourth spot with 12 points from 13 games with a healthy run-rate. Suryakumar Yadav continued with his good form, as he provided Mumbai with yet another good start. He quickly scored 27 runs off 15 deliveries before departing. However, Mumbai will want him to score more runs in the remaining few fixtures. After a few good knocks, Evin Lewis failed to provide Mumbai with a blistering start. The Windies opener departed scoring only nine runs. Meanwhile, he will have to score runs with the bat and justify his selection. The Mumbai skipper struggled to get going against a depleted Punjab side. He got out cheaply to Andrew Tye. However, he was amazing with his field placing and bowling changes. However, Mumbai will want Rohit Sharma to score runs and lead the team from the front. The young wicket-keeper batsman got a good start but failed to capitalise on it. He scored a quickfire 20 off 12 balls and departed shortly. However, Ishan Kishan had a good time with the bat in this edition and will only grow in confidence. Hardin Pandya had a very poor game after a string of brilliant performances. He gave away 42 runs in full quota. However, he will have to be in prime form and contribute to Mumbai’s success in the last few games. Krunal Pandya has been exceptional for the Mumbai based with both bat and ball. He has been a vital cog in the Rohit Sharma-led side. Pandya (32) stitched an important partnership with Pollard to take his team to a modest total. The giant Windies all-rounder returned to form at the right time. He notched his first fifty of the season, as Mumbai posted a huge total against the Kings XI. Pollard scored 50 runs off just 23 balls including five boundaries and three massive sixes. Ben Cutting had a poor outing, as he struggled with both bat and ball. He went for 15 runs in the lone over he bowled. Meanwhile, he will have to put his best foot forward in the upcoming matches. Mitchell McClenaghan bowled a terrific last over to defend the target. Moreover, he has been exceptional since he came as a replacement. The Kiwi star returned with two for 34 in his quota of four overs. Mayank Markande struggled against Punjab, as he went for plenty of runs. He gave away 34 runs in his three overs. However, this is learning curve for him, and he will only grow from here. Jasprit Bumrah single-handedly won the match for the reigning champions. Bumrah was brilliant with the ball, as he returned with three for 15 in his four overs. Mumbai will want their star bowlers to finish this league in his pick form. Also Read: Why Krunal Pandya is better than Hardik Pandya? IPL 2018: Can RCB leap SRH hurdle at Chinnaswamy? IPL 2018: Why Krunal Pandya is Better than Hardik Pandya?